The theme of Sabbath Rest, Holy Surrender, Full Life will help participants encounter a new way of thinking and being in Sabbath, through communal participation in Sabbath practices. 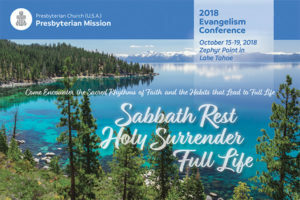 I’m excited about the planning for the 2018 Evangelism Conference, which is set for Oct. 15–19 at Zephyr Point. We have a fantastic planning team and have decided to move this gathering from the conference format to a retreat experience. The theme for this year’s conference is Sabbath Rest. We often think that if we just receive the right information, then our churches will change. But ministry is more than just information. It’s about relationships and God’s presence in our relationships. When we stop to experience God’s presence, we are more in touch with our purpose and call. Evangelism becomes a natural part of who we are. We don’t have to be trained to do something that is not already in us or good news to us. Evangelism is not just one more assignment to add to already-busy lives and ministries. We bear witness because our lives already are a witness. Therefore, we are in need of the time and space to slow down and experience again and again God’s life-changing love in Jesus transforming us daily by the power of the Holy Spirit.